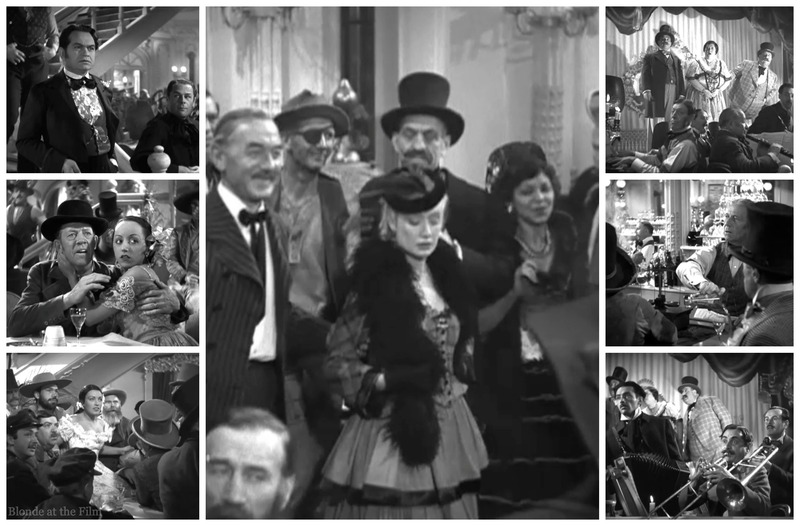 Here’s a wild romp through seedy San Francisco amidst the violence and dreams of the gold rush! The title Barbary Coast refers not to the northwest coast of Africa, but to the Red Light District of dance halls, gambling dens, and brothels that sprang up in San Francisco during the 1849 gold rush. 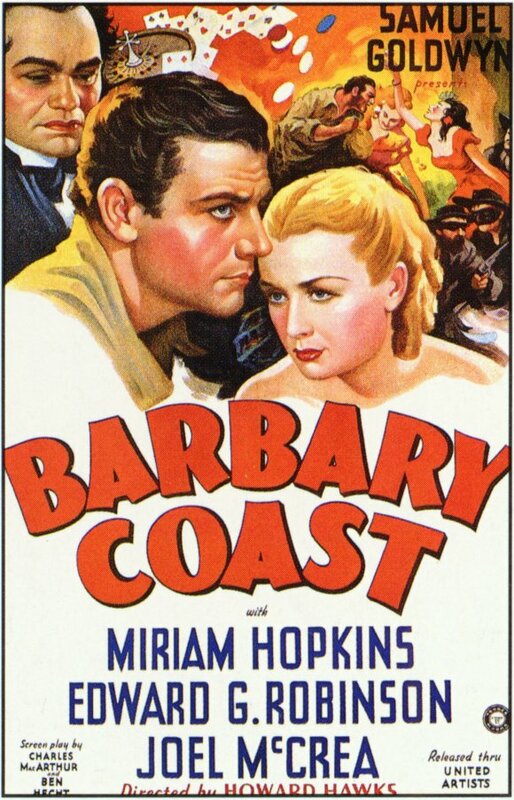 The film is based on The Barbary Coast: An Informal History of the San Francisco Underworld, a 1933 bestseller by Herbert Asbury. Fun fact: Asbury’s book The Gangs of New York would later be adapted into the 2002 Scorsese film of the same name. But the adaptation strayed so far from the source that the film was nominated for Best Original Screenplay instead of Adapted Screenplay. Not surprisingly, Asbury’s book about San Franscisco was a hard sell for censors. 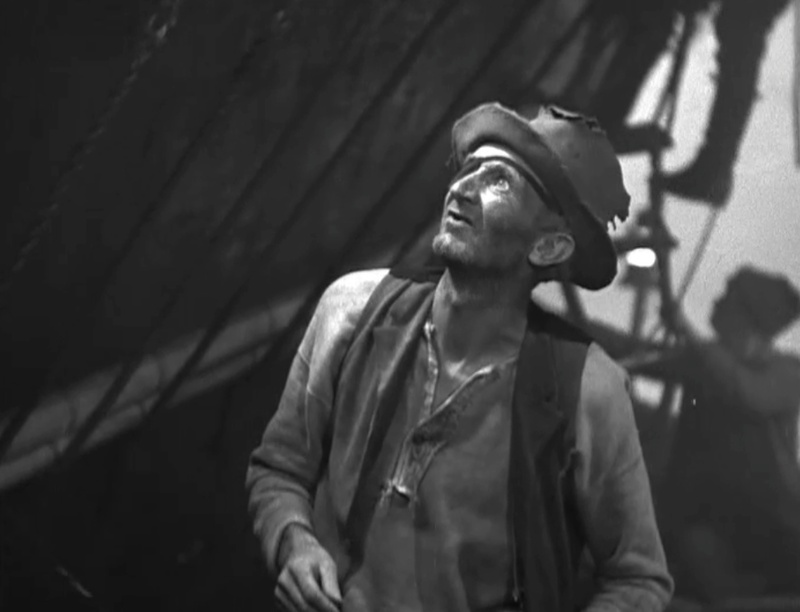 When the script of Barbary Coast was submitted to Joseph Breen, head of the Production Code Administration, he didn’t think it could ever get made. He told the film’s producer, Samuel Goldwyn, that the story was too sordid and immoral, and too full of criminals, prostitutes, and various unsavory things. 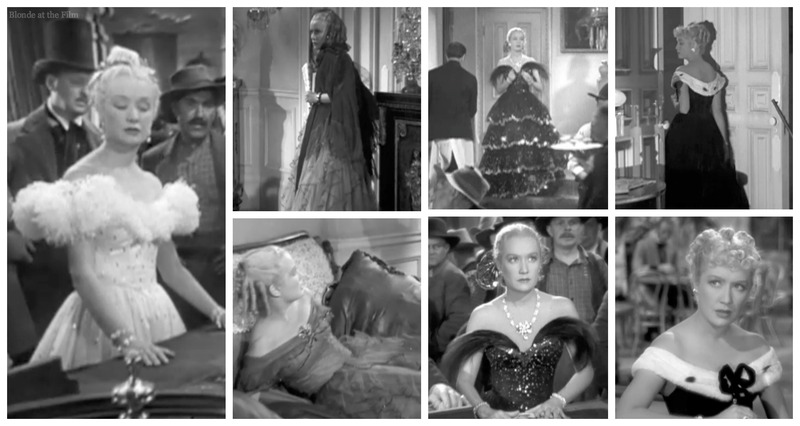 So screenwriters Ben Hecht and Charles MacArthur, with help from Howard Hawks, got to work. They wrote five different drafts, and changed it from a story about the Barbary Coast to a love story set in the Barbary Coast. Big difference. Now that the film had the green light from the PCA, production began. 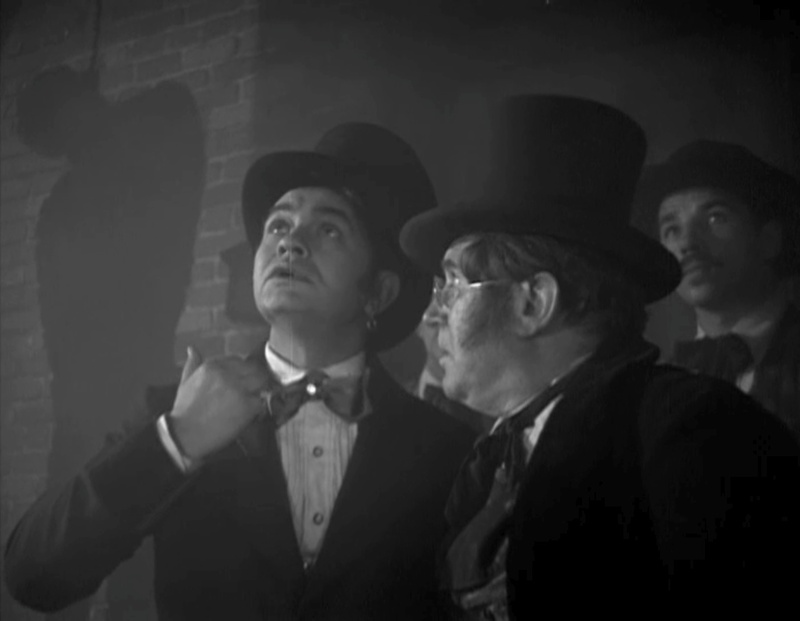 Edward G. Robinson was cast as Louis Chamalis (pronounced Sha-maul-lee), slimy king of the underworld and owner of the Bella Donna, a fancy gambling hall. 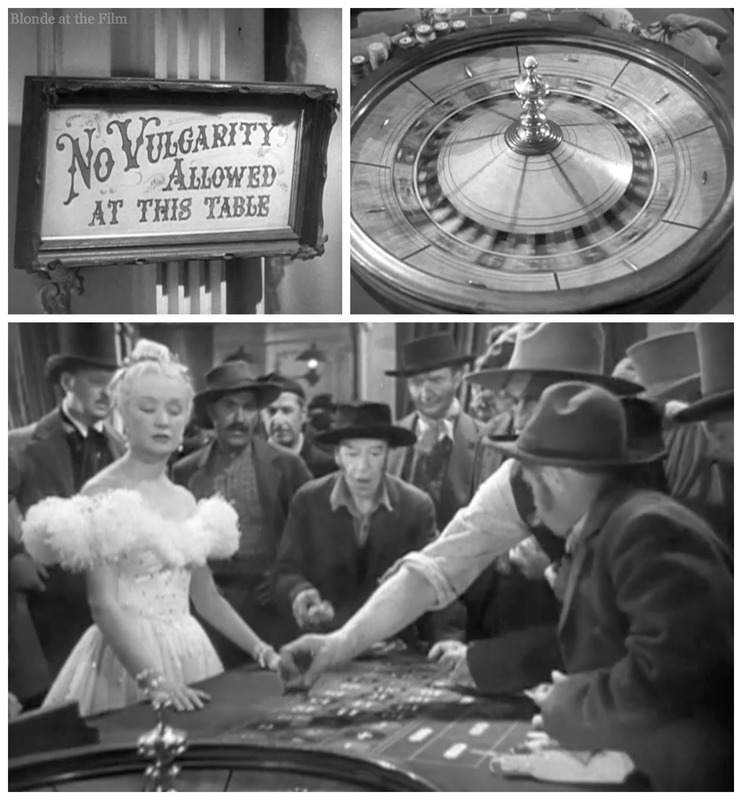 Miriam Hopkins plays Mary Rutledge, a beautiful woman searching for gold (of the already-mined and minted sort). 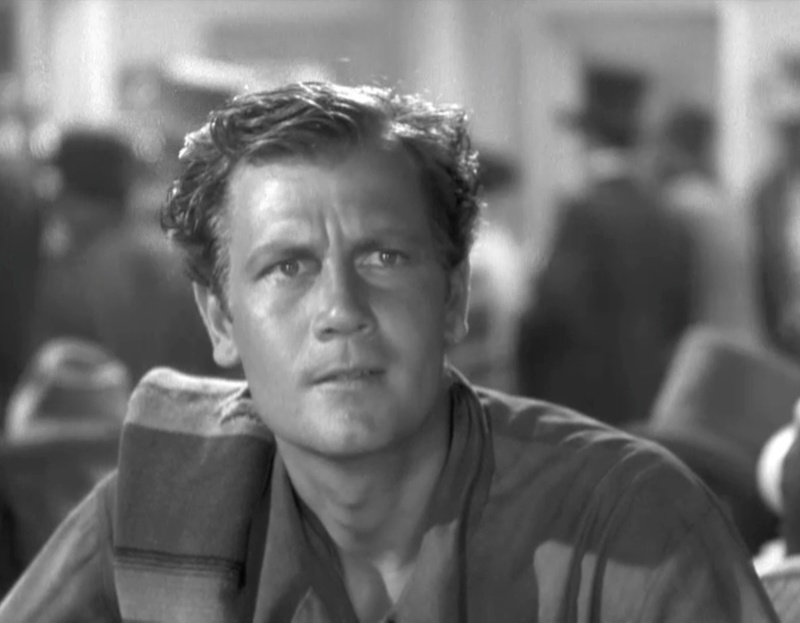 And Joel McCrea is James Carmichael, naive poet/miner. 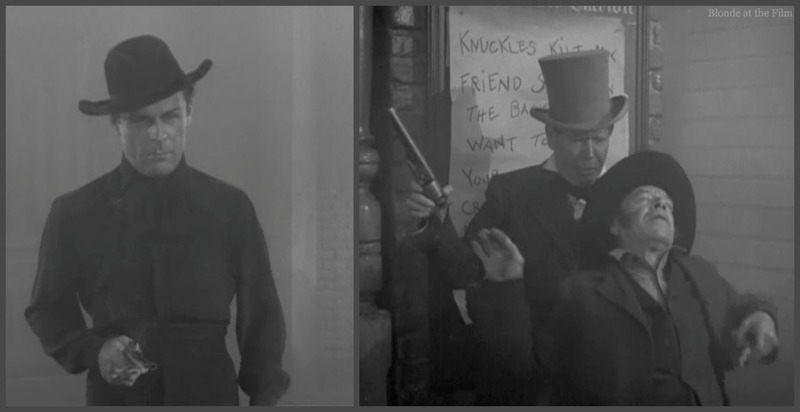 His role was intended for Gary Cooper, but McCrea is always the best choice, in my opinion. For anything. Always. Goldwyn hired Howard Hawks to direct, and off they went. It was not the happiest movie set; apparently Robinson detested Hopkins, and there were severe political divides amongst the cast, too, which caused tension. But fortunately, none of this drama kept this delightfully melodramatic and at times ridiculous movie from being made! Cut to one of those ships in the foggy bay. 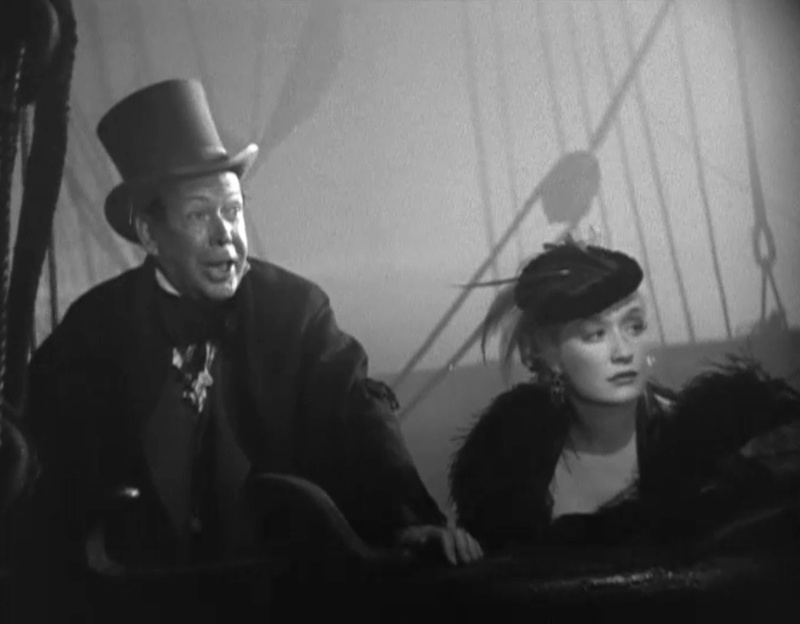 Two passengers gaze out on the lights of San Francisco: newspaperman Colonel Cobb (Frank Craven), and adventuress Mary Rutledge (Miriam Hopkins). The shots like this with the grey fog background are beautiful; cinematographer Ray June crafted a lovely film. 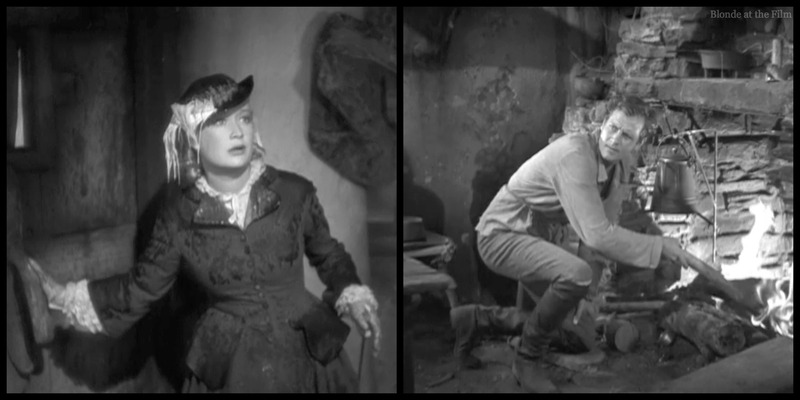 Hopkins’ smart hats and feathers, and her white-blonde hair are beautifully set off throughout, too. She’s the only female character in the whole film, and June makes her look stunning. 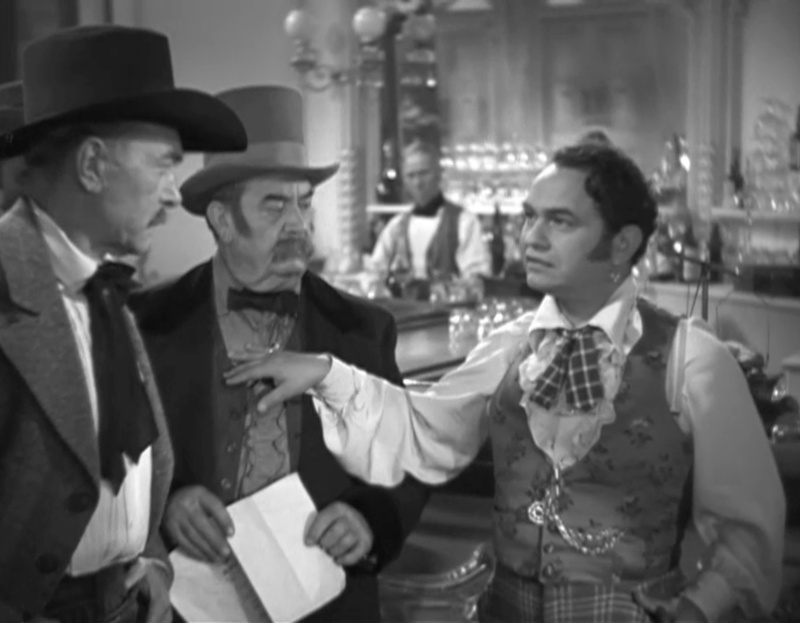 The Colonel hires this scalawag, Old Atrocity (Walter Brennan), to take them to shore. Fun fact: this was the first of six films that Hawks would make with Brennan, so look out for this hilarious string-bean of a man in your next Hawks film. Once in the rowboat, Old Atrocity doubles the cost of passage. 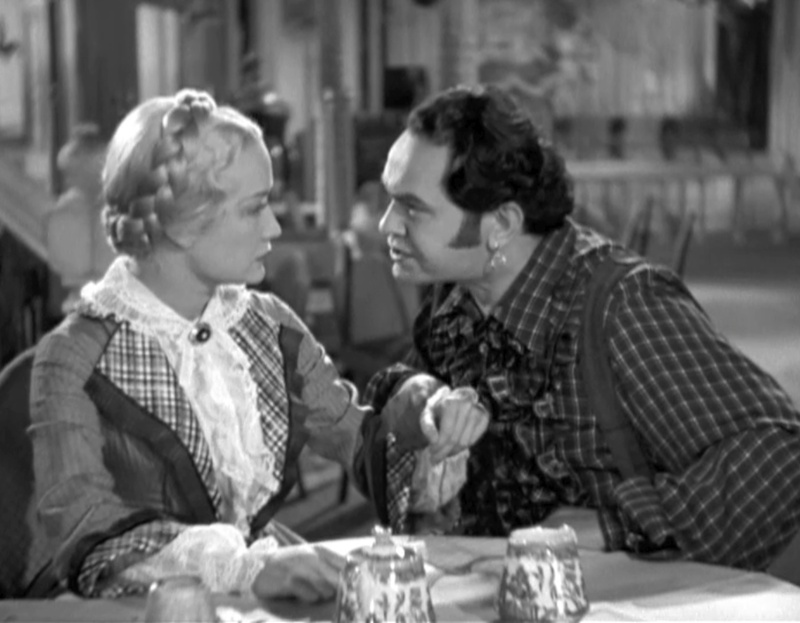 The Colonel and Mary don’t have enough to pay the new rate, so Old Atrocity is about to dump them into the bay when Mary tells him that she is Dan Morgan’s fiancée. This Morgan fella must be powerful because Old Atrocity rows them to shore double-quick. 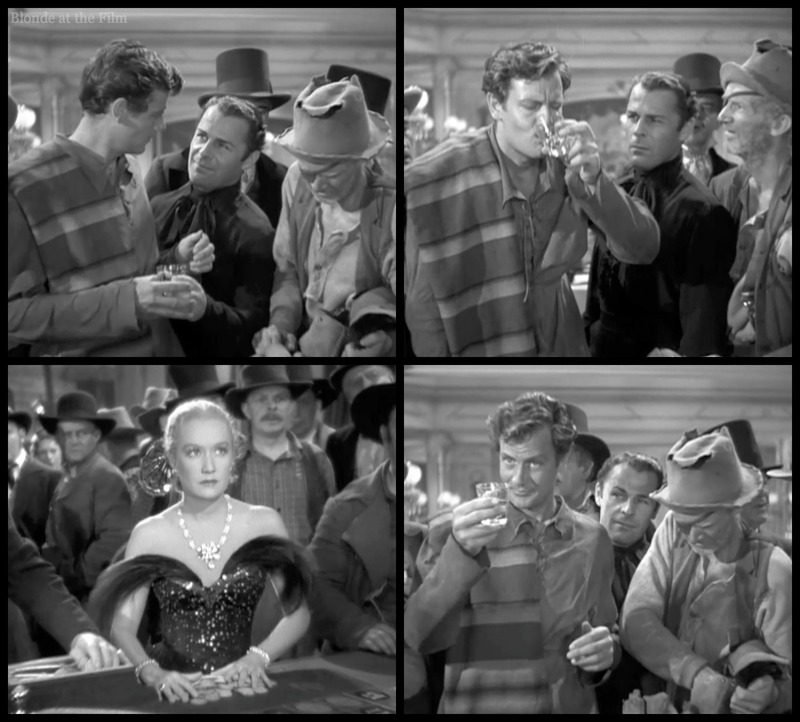 The guys at the docks are pretty excited to see a “white woman.” They’re less excited when they have to give her the sad news that Dan Morgan is dead, and that he lost his entire fortune gambling at the Bella Donna. 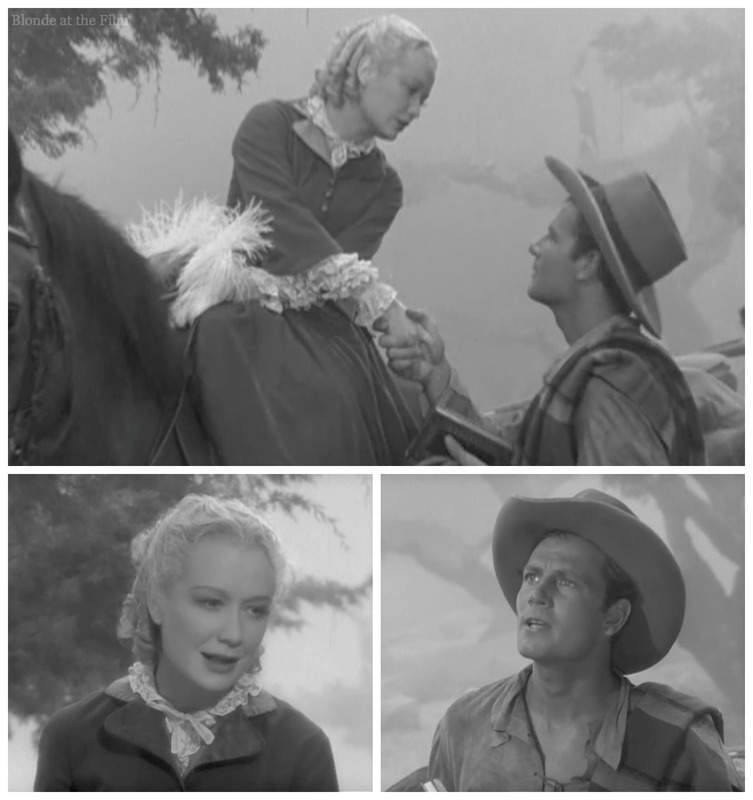 Mary cries, but she’s quick to tell the Colonel that it’s not because she loved Dan Morgan. She was going to marry him for his money, but now those plans are dashed, and that’s why she’s crying! She doesn’t cry for long, though. Morgan’s money went to the Bella Donna, so that’s where she’s going, too. She’s here to make her fortune just like everyone else, damn it! You can watch the scene here. It seems that she is the only “white woman” in the Barbary Coast. 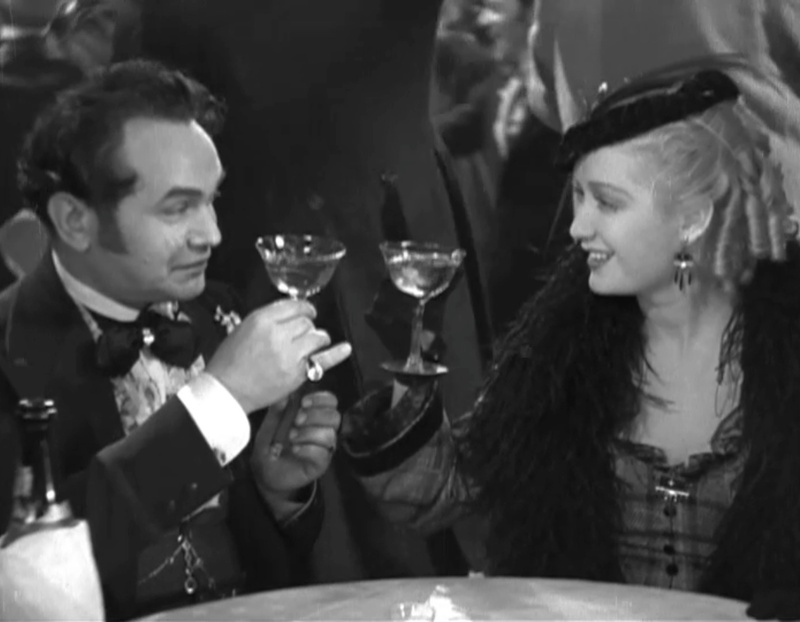 Louis Chamalis is taken with her at once, and saunters over to introduce himself. Louis is the richest, most powerful man around, so they’re fast friends. You can watch their meeting here. The next morning, Mary has a hangover. Louis saunters into her bedroom without knocking to bring her a hangover cure. There’s something brutish about this toad-like vice king. His ruffled shirts, embroidered vests, elaborate neckties, and sparkling jewelry (please notice the large hoop in his left ear, and his collection of brooches and tie pins) make a creepy, gaudy package for his violent nature. 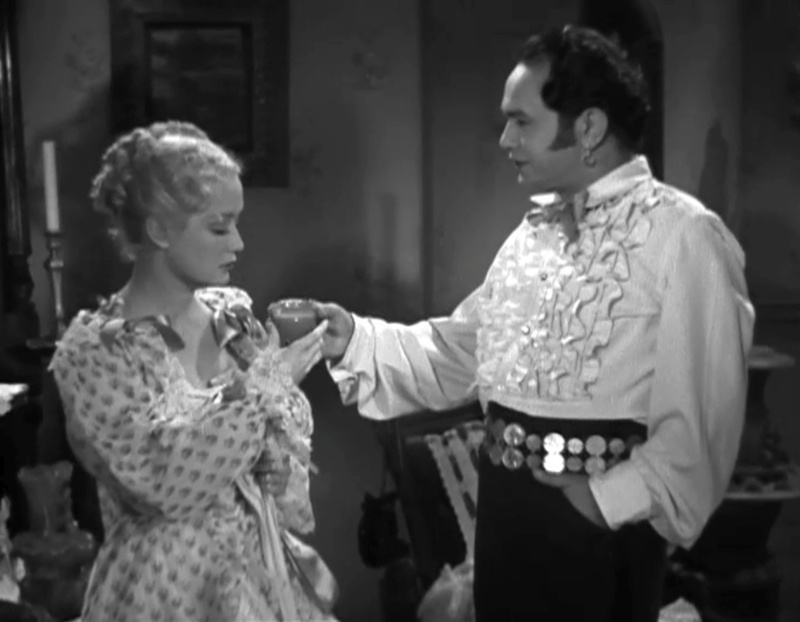 Alexander “Omar” Kiam designed the costumes for this film. He was Samuel Goldwyn’s head costume designer from 1934-1939, and designed the costumes for many United Artists films, too, before returning to New York to open a retail fashion business. 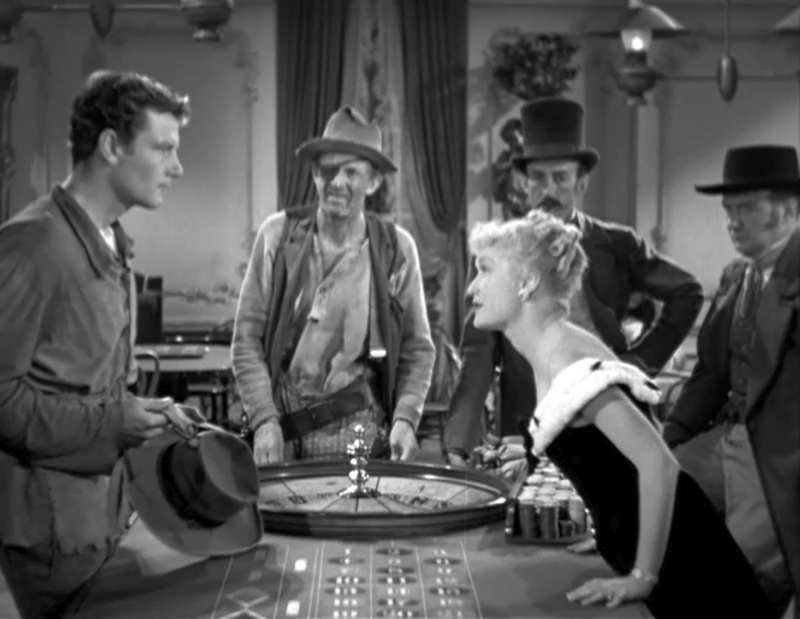 Anyway, Louis has a proposition for Mary: he wants her to run a roulette table in the Bella Donna. He realizes she is a major attraction in this backwoods town, and she can charm the gold off of most miners with just a smile. If her smile isn’t enough, she’ll have a rigged roulette wheel at her fingertips. Louis has it all figured out. Why would he spend time prospecting when miners bring their hard-won gold straight to him? He also seems to have taken a liking to her. He becomes furious when the mayor and his wife insult Swan, even though Swan tells him that he has to get used to it. People assume she is his mistress, and just her status as employee of the Bella Donna means she will be treated badly by “respectable” society. She seems okay with it, though. 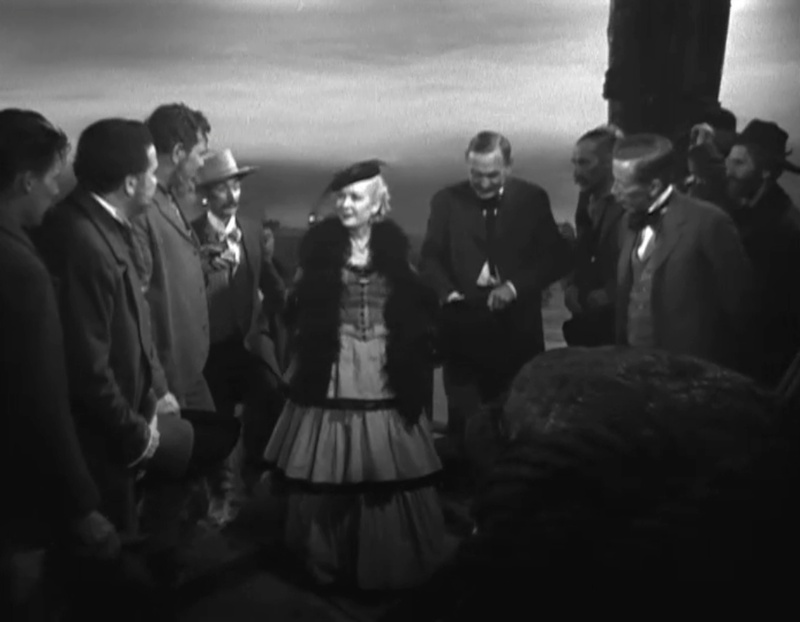 She’s got plenty of money, she’s protected by Louis and his thugs, and she gets to humiliate and cheat those bad men she was already so bitter about at the beginning of the film. Plus, she’s got pretty dresses and diamonds to wear. It’s not all shopping trips and free booze, though. Shockingly enough, sometimes miners are poor losers, especially when they lose the gold it took them two years in the wilderness to get! Things start out nicely for these two guys, but eventually it gets ugly. 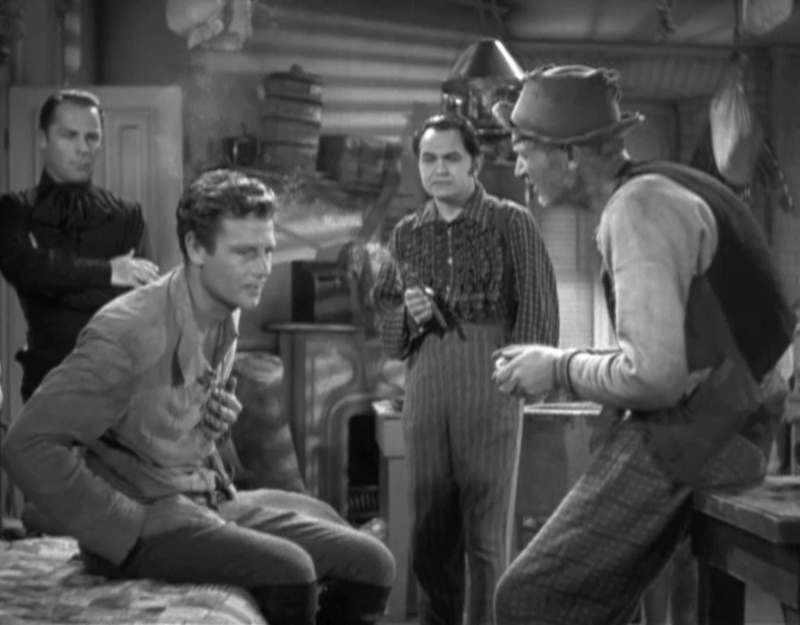 Louis comes over with his favorite thug, Knuckles (Brian Donlevy), and the big guy has to carry the little guy out. The only witness is a Chinese man, but Knuckles isn’t worried. The Chinese are treated horribly in this movie, no better than stray dogs, if you hate stray dogs. Drunk men chase Chinese men around the city trying to cut off their ponytails, for instance, and when citizens try to hold Knuckles accountable for the murder, the Chinese man’s testimony doesn’t even count. It’s the villains who are the worst to the Chinese citizens, though, so at least that’s positive? It’s a nasty picture, though. But Louis hears about it. He orders Knuckles to destroy the printing press, but Swan gets there just in time in her sparkly scarf to plead with Louis to save the press. Louis can’t say no to Swan. 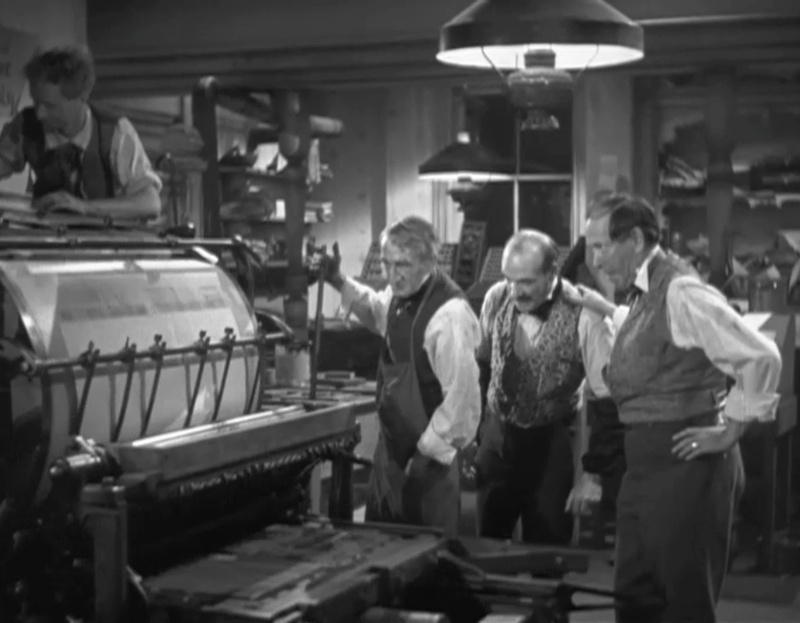 He tells Colonel Cobb he’d better not print anything negative about him, ever, but he leaves the press intact. When they return to the Bella Donna, Swan confronts Louis about the murder. He acts surprised that she didn’t know what happened when the men left her table. Ahh, the guilt! She’s disgusted with him and with herself. But she doesn’t love him! And surprise, surprise, grabbing a woman and yelling at her that she’d better love you or else! is not the best way to forge a lasting, healthy love. Hopkins is not to be outdone in the dramatic pronouncements, though. She plays the “fallen woman” card and goes full-Swan. She’s no longer Mary, remember. 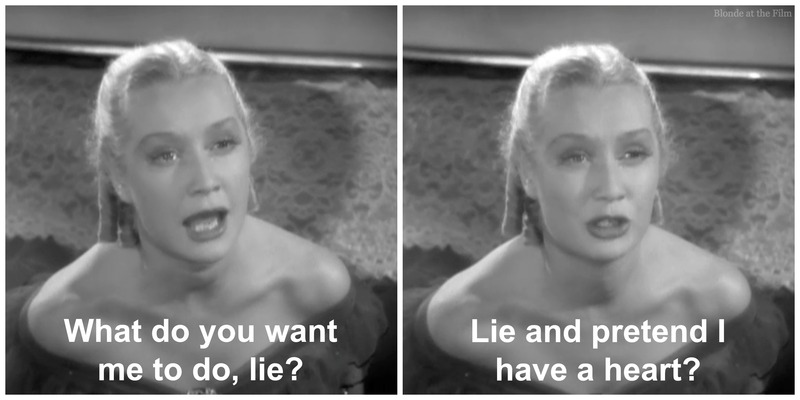 She’s immoral, heartless Swan! Running a roulette wheel will really ruin a girl! She says that she can’t give Louis the love that he wants, and can’t they just have fun in their seedy little world? It’s dramatic and over-the-top, and a definite change in tone. From now on there’s plenty of drama like this–so get ready! Ahh, yes, I have often told people that I wanted the “wind and the air on me,” too. She heads out in her elegant riding habit even though Louis warns her that it’s going to rain. She tells him that she likes rain, too. 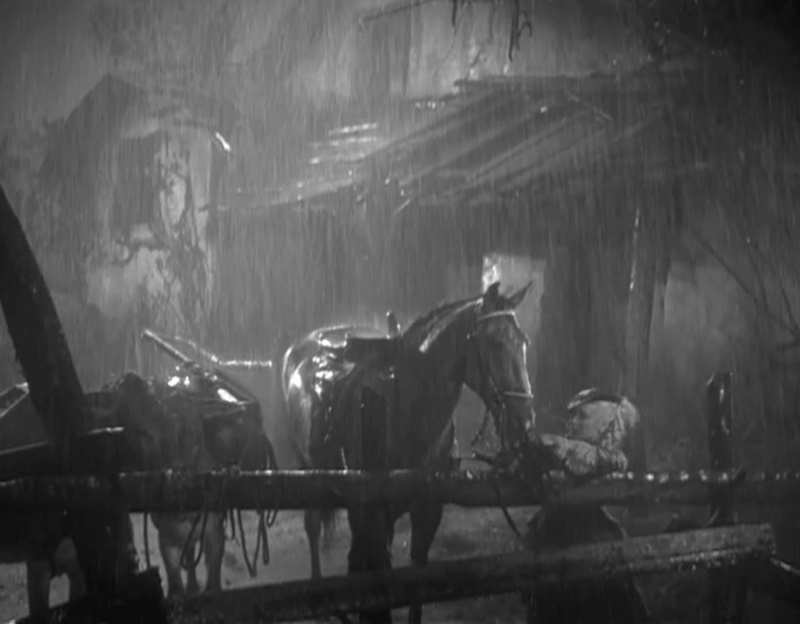 She takes shelter in a little shack, which just so happens to be the home of James Carmichael (Joel McCrea). 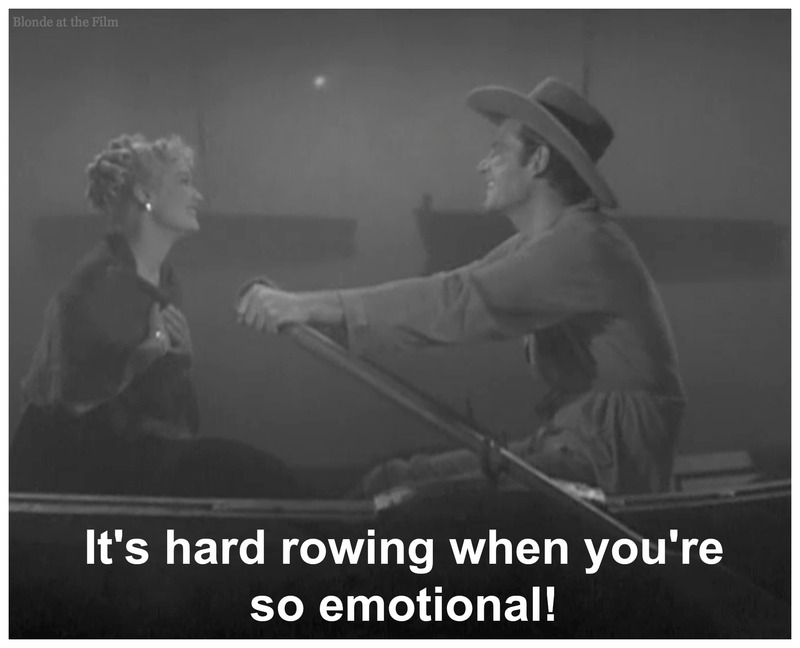 Finally, Joel McCrea! James is a gorgeous, appealingly-rustic, tall, young man–quite a contrast to Mr. Toad the dandy back at the Bella Donna. He hasn’t seen a woman in two years, so he’s pretty excited to welcome this pretty stranger to his home. 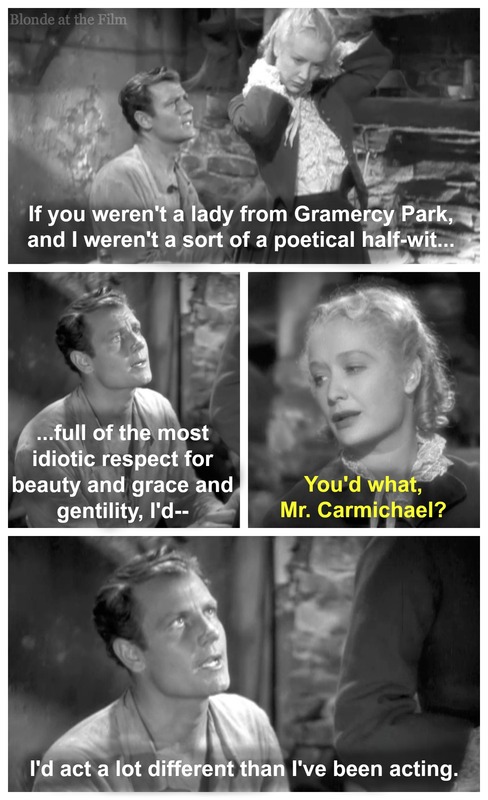 James tells her he is a poet from Gramercy Park, and she tells him that she’s from New York, too. She says that she’s visiting a ranch near San Francisco with her family. Lies, all lies. Then she takes off her clothes. To dry them! Just to dry them. He turns his back and everything, and since he’s a poet she trusts his impulse control. They have the most wonderful chat waiting for her clothes to dry. 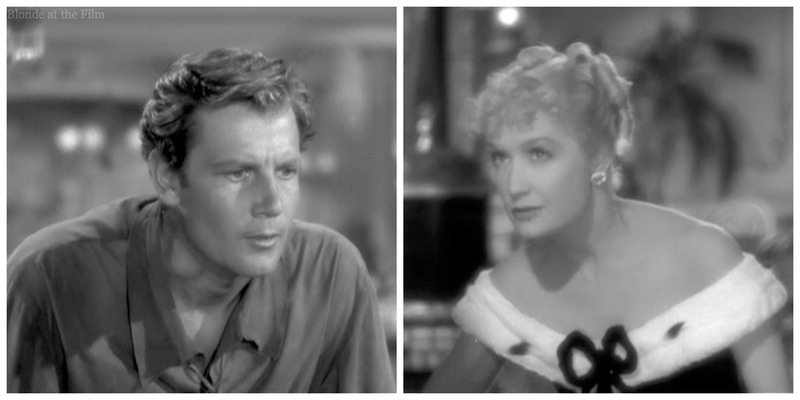 James tells her that he is catching the next boat back to New York with his bags of gold. He has heard of the harpies of San Francisco, and he plans to head straight to the dock without a single detour into the dens of iniquity. Swan approves of his plan, without ever letting it slip that she’s one of those harpies working in one of those dens. Anyway, Swan says goodbye, looking beautiful, softly lit, and innocent. She knows they’ll never see each other again, and she wants to remember their wonderful afternoon just as it was. I’m amazed at how perfectly her hat-feathers dried. They look good as new! Swan heads back to her sordid life in San Francisco, and James heads to the boat that will take him far away from that place. But when James arrives at the docks he finds out that his boat is delayed due to fog. He just happens to run into Old Atrocity at the docks. No good can come of that, and definitely not after James stupidly shows Old Atrocity his bags of gold. The devious old-timer takes his gullible new friend to the Bella Donna for dinner. Guess who he sees? James is devastated. And handsome. He tosses back some liquor and goes to her table. She is shocked to see her poet. James assumes the worst about her, and he gets mean. She fights his meanness with her own bitter meanness, until both of them are tossing cruel looks and comments, as well as shots. Old Atrocity is bewildered by their behavior, and funny. Louis notices and sends Knuckles to give James a drugged drink, compliments of the house. And the drugged, drunk dummy starts betting. He bets it all, everything he’s got. Even Old Atrocity is begging him to think it over! Swan is hurt, so she shows him no pity at the rigged wheel. James loses, again and again, until it’s all gone. He drops to the floor, the drugs finally taking effect. Swan 1, James 0. But she doesn’t feel very good about it. The next morning, James wakes up in the Bella Donna, inexplicably surrounded by Knuckles, Louis, and Old Atrocity. He asks for work so that he can earn his passage home. 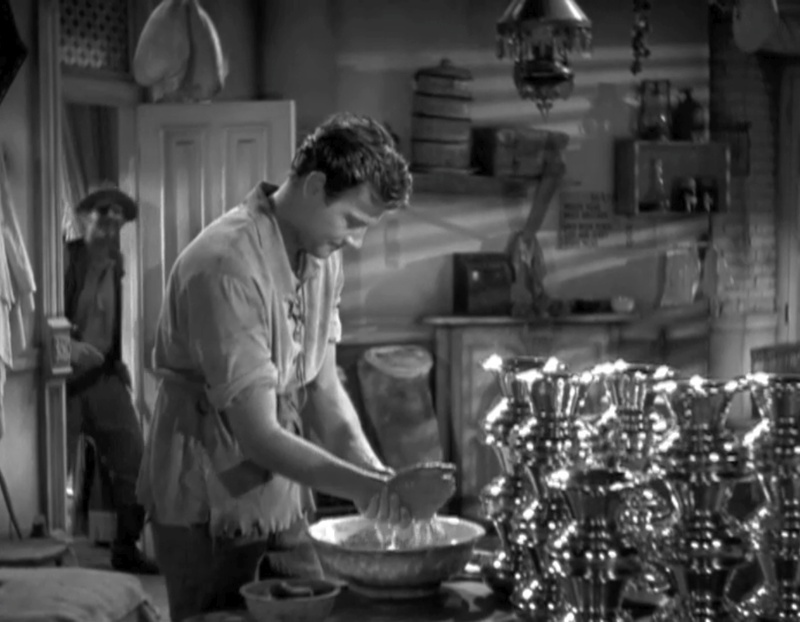 Some spittoons need cleaning, says Louis. 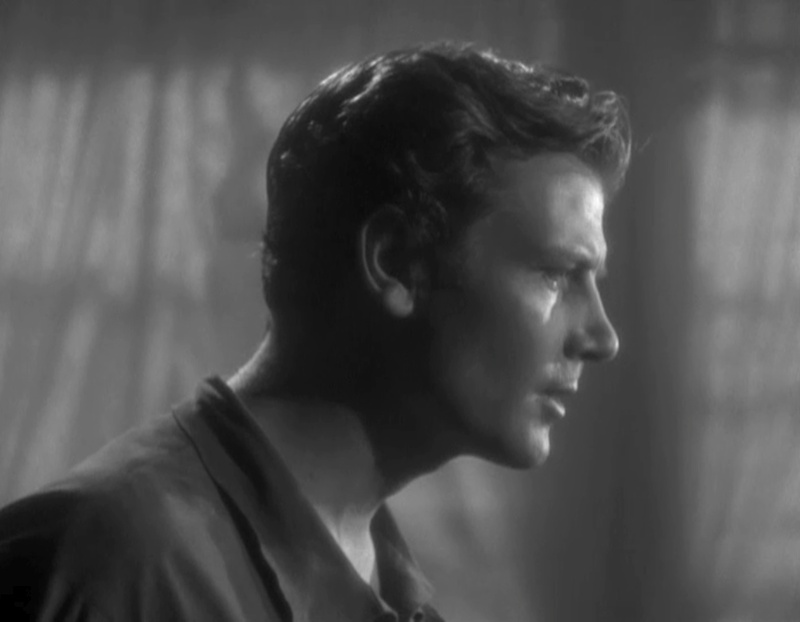 But I’m distracted by the size of Brian Donlevy’s head! Maybe it’s partly the floppy bow on his black shirt, but doesn’t his head look disproportionately massive? And don’t you maybe think that Louis and Knuckles are in love with each other, but neither can face it? Guess who is first customer is? Swan, dressed as Heidi. They’re still sassy to each other, but James seems embarrassed about the way he behaved. Then Louis comes over and threatens Swan some more. He knows she was with a man when she was out in the rain the day before, and he’s terribly jealous. She refuses to tell him who it was though, and he has no idea that it was James! He also orders a steak and a piece of pie for breakfast, so he’s got more than lady troubles. It’s melodramatic with a melodramatic score and melodramatic dialogue, but it gets the crowd’s attention. 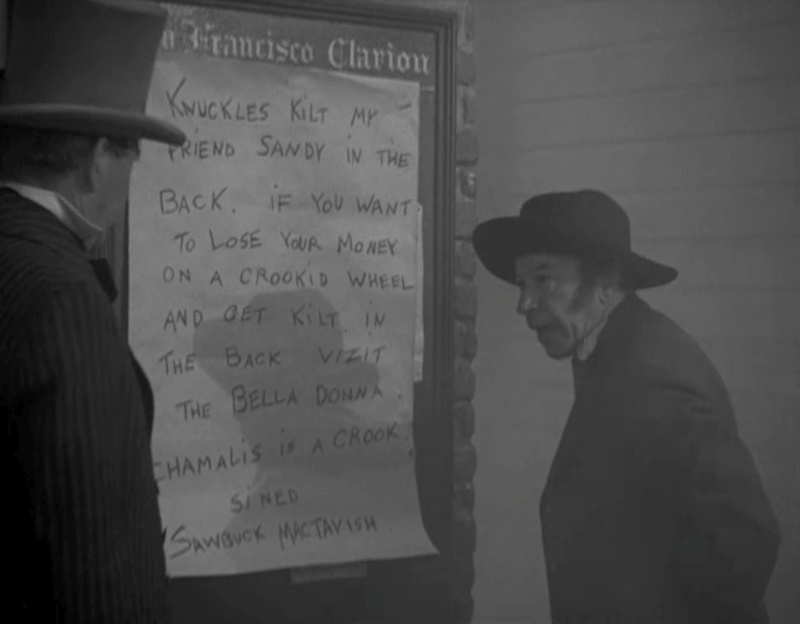 The newspaper is going to print the truth about Chamalis and Knuckles, and bring some much needed law and order to San Francisco at last! Armed men take the newspaper into the streets. Nothing can stop them! 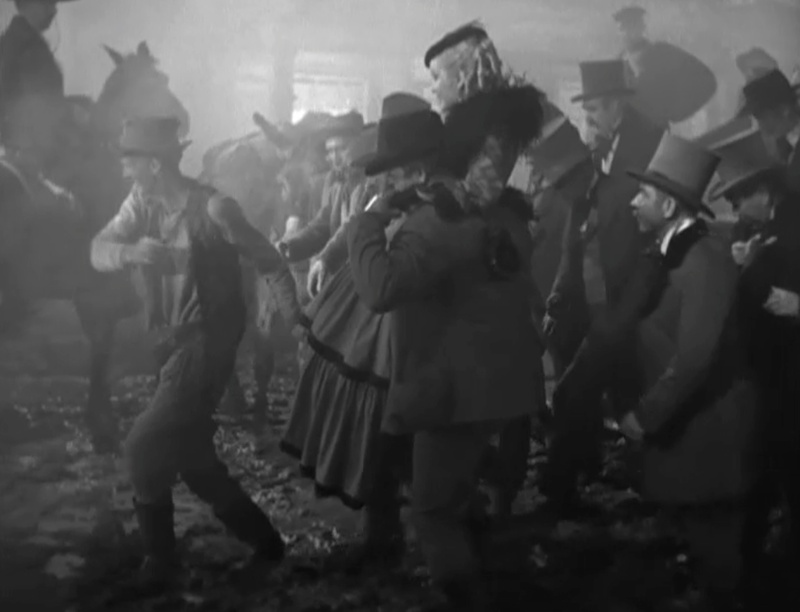 It’s an inventively filmed sequence, and gorgeous in the pale greys of foggy black and white. Anyway, back at the Bella Donna, business is slow. People are staying away from Louis and his rigged gambling house. Good news for James, though! The fog has lifted enough for his boat to depart. And Old Atrocity found one of James’ bags of gold that had “fallen” on the floor (Old Atrocity stole it, but he decides to return it.) He likes James. And she taunts him for returning home a failure. Is she being mean, or is she trying to get him to play one last time? James is easily manipulated. He bets his only gold, and wins. 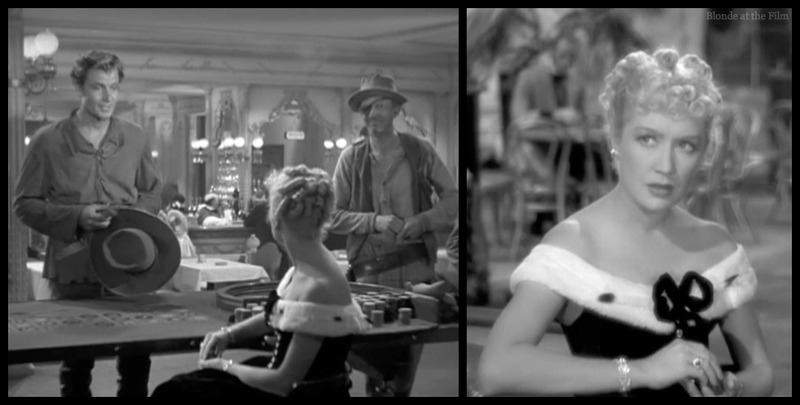 She urges him to keep playing, and when he hesitates she basically bets for him. 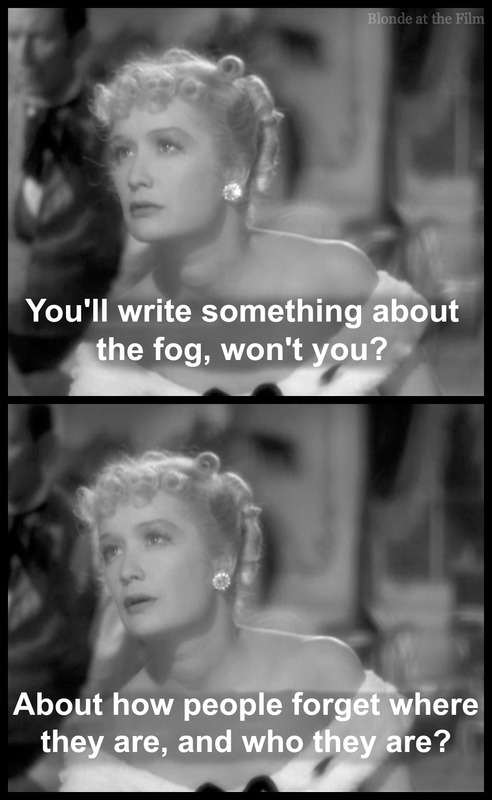 She’s all about the fog, and he’s all about her. But he leaves. When Louis finds out what Swan did, he’s furious. He figures out that James is the man she met in the rain, too. So he’s doubly mad. Louis locks Swan in her room and departs with his own posse to take back the town. But guess what handsome man is hiding in Swan’s bedroom? She protests that she’s not Mary Rutledge anymore, that she’s bad and low down and can never be good again. He tells her he doesn’t care, and that underneath all the Swan stuff, she’s still pure, untouched Mary. See how convenient that Swan/Mary split is? Whatever, it’s a beautifully shot scene of love and redemption. And boy, do her platinum ringlets catch the light! 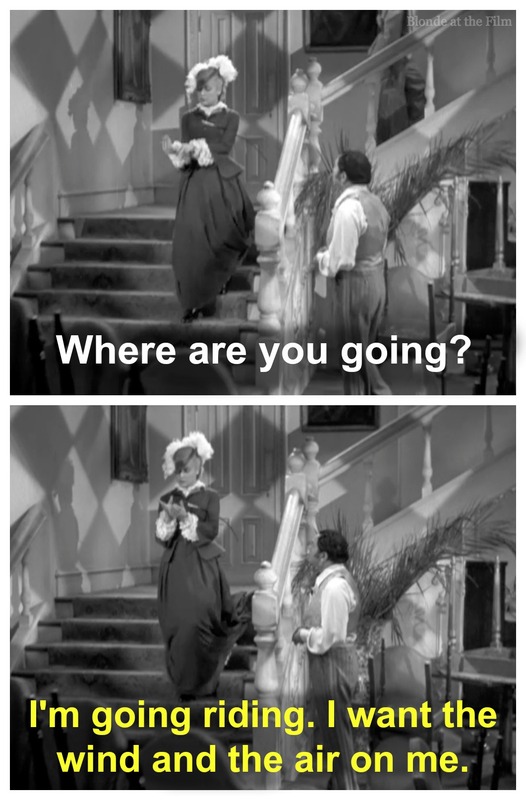 But Louis finds out she’s gone, and knows where she and James are heading! Chase scene in the bay! But delirious James keeps talking, and somehow it doesn’t occur to Mary to cover his mouth and shut him up. 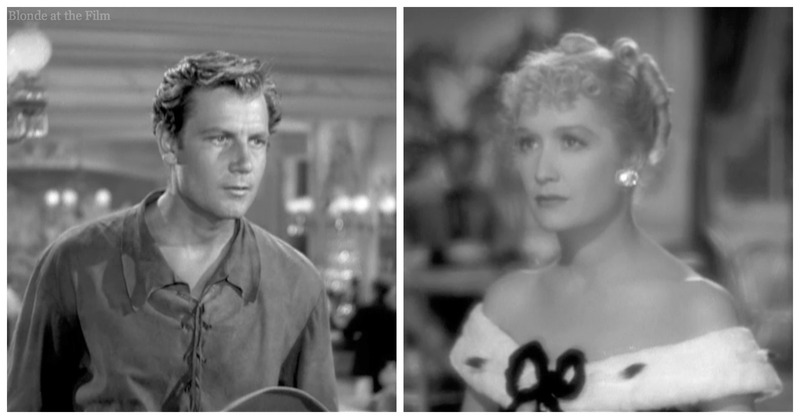 Louis finds them, and Mary begs him not to kill James. She promises Louis that she will love him the way he wants to be loved, that she will be his, but only if he spares James’ life. Poor, stupid Louis is like, “Okay!” He takes James to the ship where we learn that James will be fine in no time. And Old Atrocity brings him the $40,000! All’s well, almost. Mary keeps her word and leaves with Louis. But Louis finally figures out that he can’t make Mary love him, and she can’t make herself love him, not really. He watched her with James, and knows she will never look at him the way she looked at her beautiful poet. 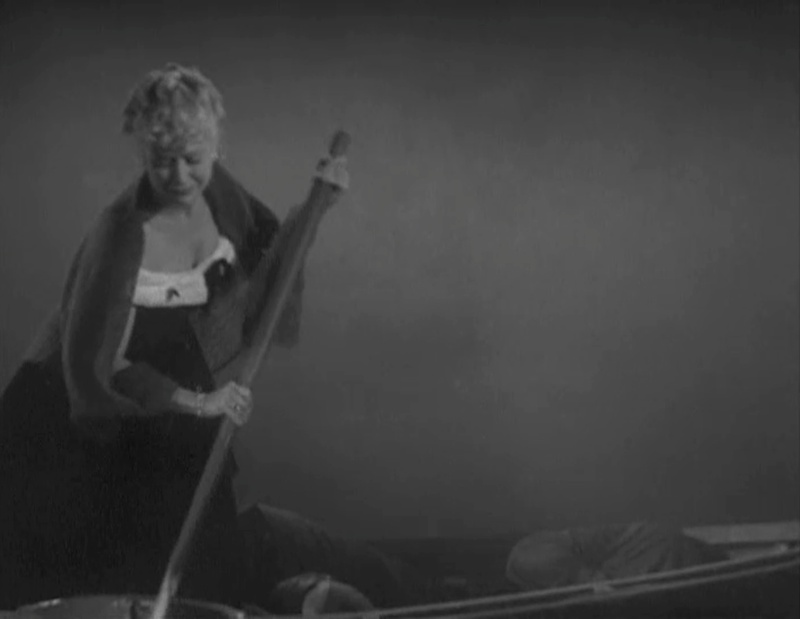 He gives her up, which is lucky, because he’s about to be killed, probably. It wouldn’t be very healthy to be Louis’ girl, now. He tips his hat in a faux-gentlemanly goodbye, and she scurries away, back to her beloved. You can watch it here. 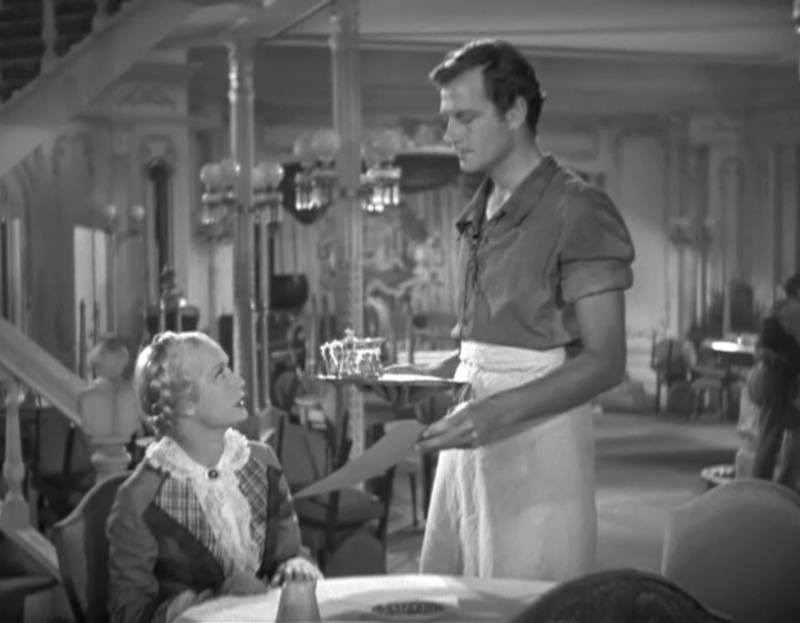 This was the second film that paired Joel McCrea with Miriam Hopkins. They would star together in five films over three years: The Richest Girl in the World (1934), Barbary Coast (1935), Splendor (1935), Woman Chases Man (1937), and These Three (1936). 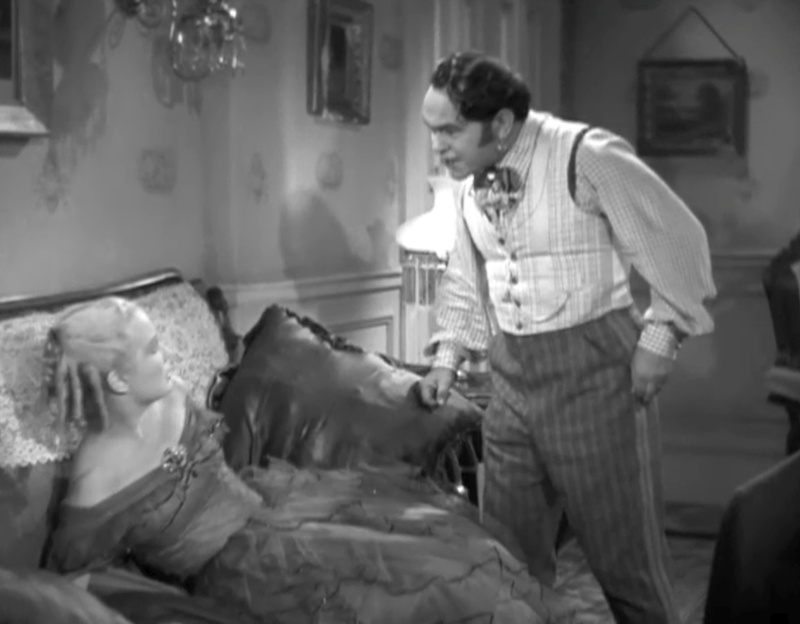 I love their work together in comedies the most (Richest Girl and Woman Chases Man), because I think Hopkins is better as a “fast-talking” screwball dame than a dramatic character like Mary in this film. 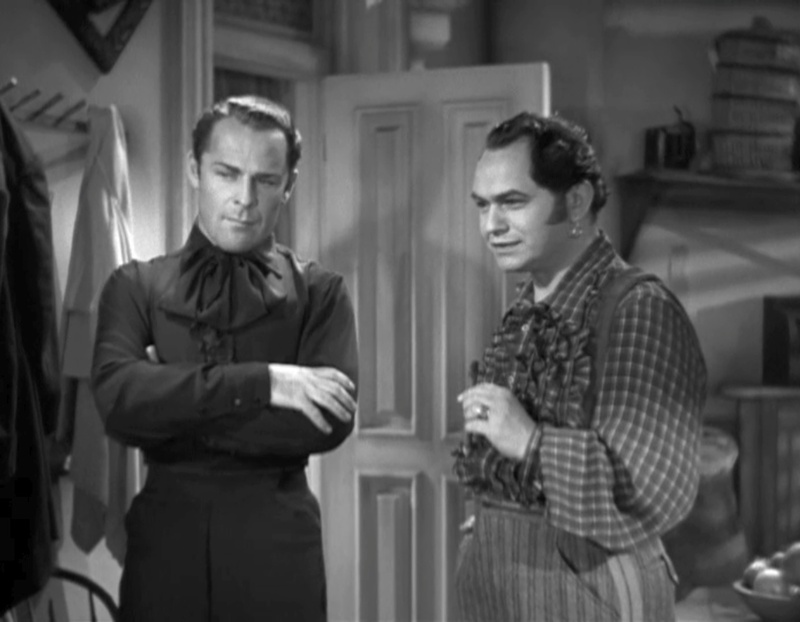 And McCrea is wonderful in comedies. Even with the approval of the Production Code, Chicago still threatened to ban this movie. So Goldwyn ordered a few changes to a few scenes, and Chicago accepted the edited version, even though the Chicago Legion of Decency condemned it. The film is quite tame, but seedy and hyper-dramatic. 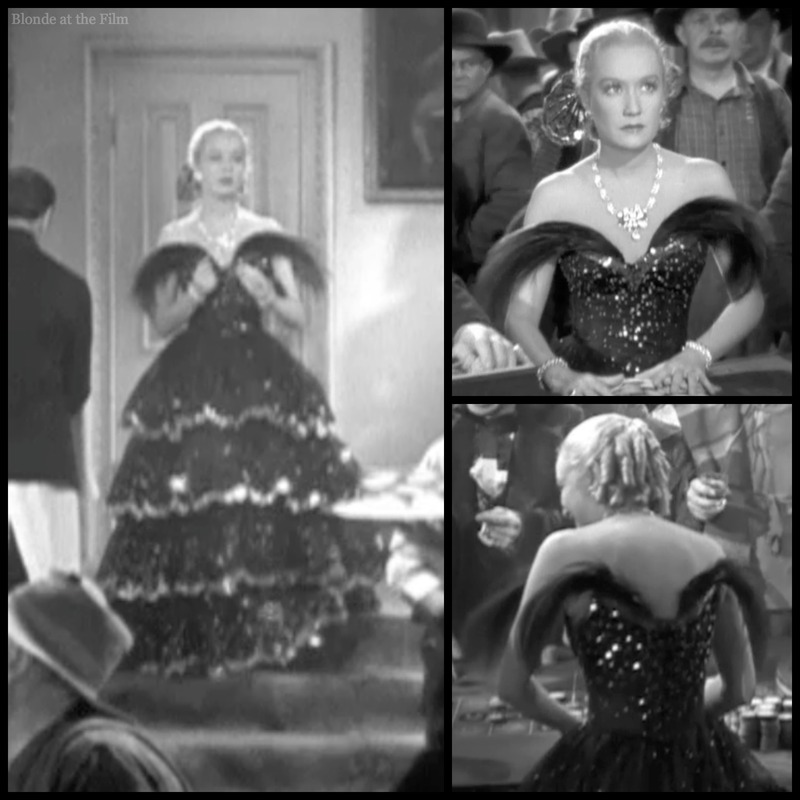 My main objection is that Swan’s gowns stay remarkably clean despite the inches of mud in the streets…but that’s something I love about classic movies. Realism isn’t at the top of the list! Here’s the trailer–enjoy! For more images like this one, visit my Instagram, Twitter, tumblr, pinterest, and Facebook! And you can buy this film here. Hopkins, McCrea and Robinson sharing the screen? I definitely need to give this one a watch! It’s a wild movie; foggy, dramatic, and fun! One of my favorites. Hawks was a master. (Only Angels Have Wings is brilliant.) 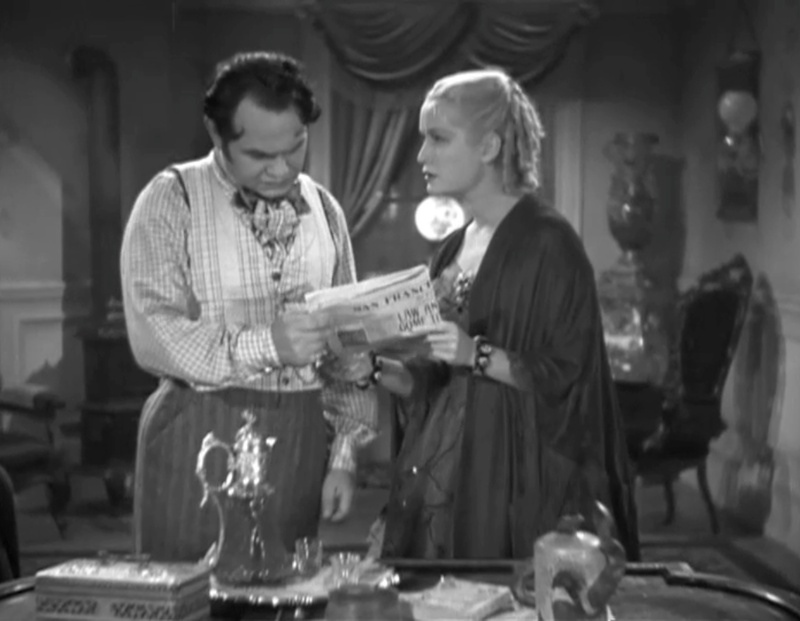 Miriam and Edward G. may have had difficulties on the set, but they were magic on screen. 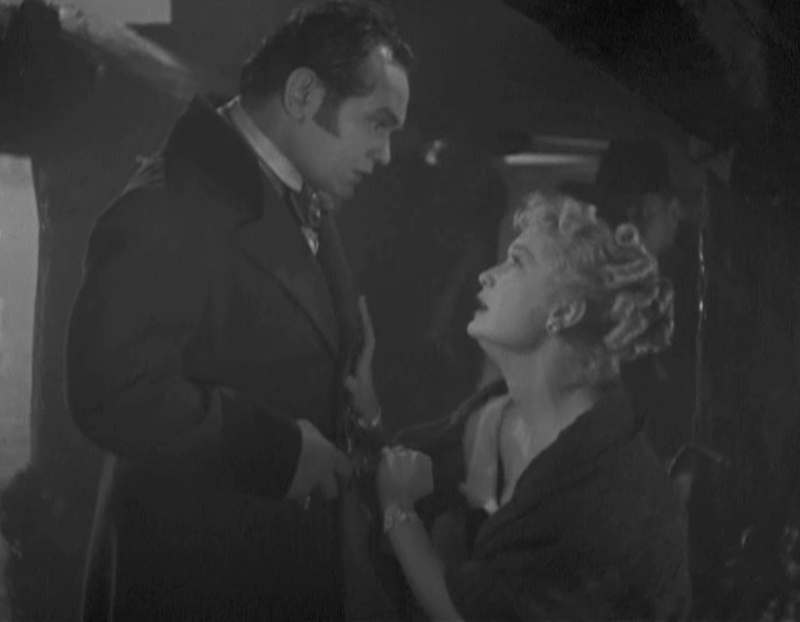 Miriam Hopkins was a fine actress, but she was known for scene-stealing and for angling herself in a shot so that her face would catch the camera’s eye (Fredric March also complained about working with her in the 1932 Dr Jekyll & Mr Hyde). 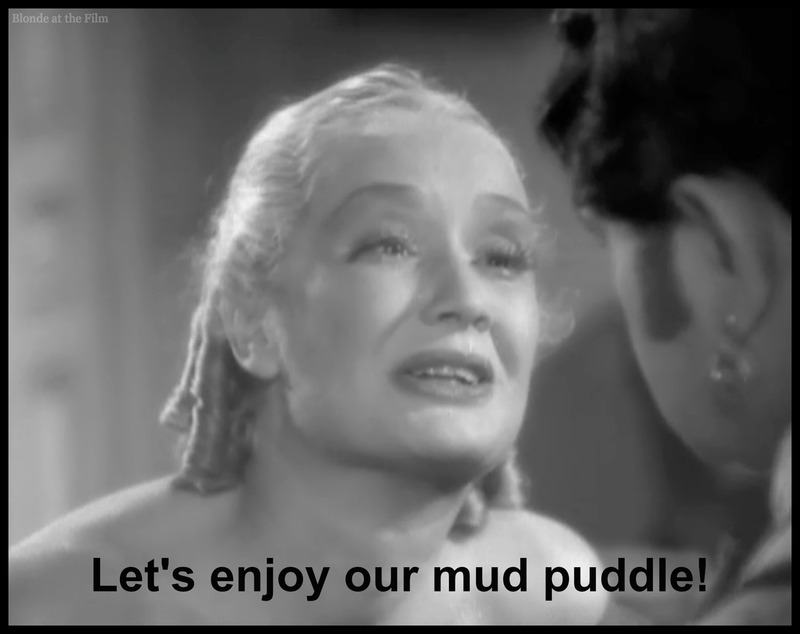 But I just love her anyway, and I love her performance in this film; she gives her all to its melodramatics! I agree! She’s delightful to watch but must have been difficult to work with…I love her in Woman Chases Man! Great review Cameron! I love EG Robinson and could go on and on about the greatness of this actor and man. He is one of the finest actors to ever grace the silver screen. I have now seen over 70 EGRohinson films and have enjoyed them all. He is a special actor who never disappoints the viewer. Here is my list of some my favorite EGR movies. Thanks for this great list, John! Scarlet Street is one of my personal favorites! I was not impressed by this film. McCrea and Hopkins lacked any screen chemistry. Robinson was all over the map. And the screenplay seemed like a ghost of what it could have been. Definitely not one of Hawks’ best.